Published: Friday, July 10th 2015. Our design team has created a brand new screenshot service, using the thumbnail.ws API. 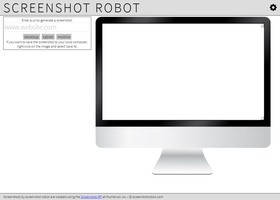 You can find the end result at screenshotrobot.com. You can use this website without a thumbnail.ws API key: just enter a URL and the desired output format and a screenshot will be generated for you on the fly. Did you build an application using the thumbnail.ws API and want to be featured in the next showcase? Send us your website URL now!